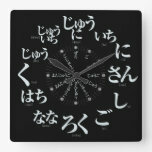 ﻿ Japan Hiragana style [black face] Square Wall Clock : 和風イラスト あおきもの. The carp which flies in the flower top of a cherry blossoms. The picture of the hawk which flies over the camellia top drawn in the shadow picture tone.